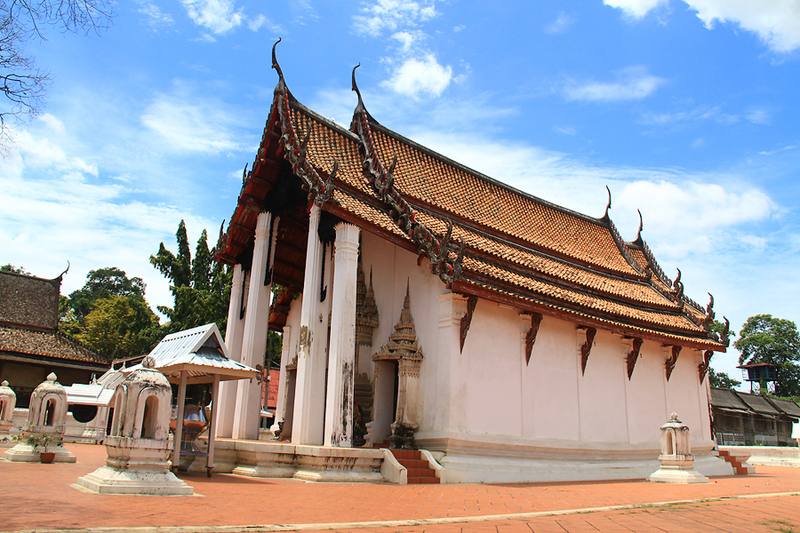 The temple was built in the reign of King Narai the Great, front gable of the temple decorated by rafted wood in form of Vishnu riding Garuda (the garuda is currently stolen), the upper part is teak decorated by Mon decorative wood (crafted wood decorated in front gable which is Mon arts) at gable (the triangle beside crafted wood) decorated in form of lion and Kodchasri. Architectural characteristic is Maha Utt style which means there is no wall drilling at all, basement of the temple is sagging (construction the temple in sagging style can be explained by architectural reason as when weather is hot, heat is floating high and cool weather shall flow to replace instead easily) In the temple consists of the principle Buddha and disciple Buddha as well as mural painting in the late Ayutthaya erahighly craftsmen of Nonthaburi depicted Ten Great Previous Births of Lord Buddha which is deemed as one of the oldest mural paintings in Nonthaburi province and this the temple that implementing preservation of the temple and arts properly and becoming knowledge source attracted both Thai and foreigners, besides, there is an ancient sermon seat as old as the temple decorated beautifully located on sermon hall. This temple is praised as implementing preservation of arts properly which is remarkable. – By car, driving along Phra Nungklao Bridge until arriving at the second traffic intersection, tune left to Bang Kruai, passing through Wat Suan Kaew, straight to Bang Kruai – Sainoi route and you shall see the sign boards that lead you to the temple. – By boat, embark ferry at Nonthaburi pier across the river and proceeding minibus Bangyai – Pier, the bus stop is close to Wat Chalerm Phra Kiat.